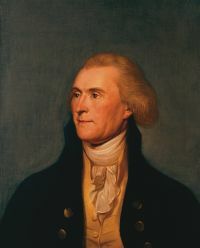 Thomas Jefferson, by Charles Wilson Peale. Our education system is currently in crisis. It is no secret that American children are at best average when compared to children from other countries (see, e.g., this Huffington Post article), and our adults fare very poorly on tests of math, science, history, and general knowledge. “A system of general instruction, which shall reach every description of our citizens from the richest to the poorest, as it was the earliest, so will it be the latest, of all the public concerns in which I shall permit myself to take an interest.” (http://www.monticello.org/site/jefferson/quotations-education). A democracy only functions when its citizens are educated and moral. Morality, too, is a necessary product of education: how can one make moral choices without access to the facts of the injustices that exist in the world? How can we evaluate the moral claims of our elders and leaders? Jefferson was a huge proponent of education for these reasons. Only with the knowledge of history, oratory, logic, reason and critical thinking can we make informed decisions about those who seek to rule us in a system of competing interests. Absent these knowledges and skills, we are prone to tyranny. And above all, Jefferson sought to eliminate the possibility of tyranny. Many of my friends have opted out of politics. They do not watch any news or read any newspapers, skip over political posts on social networking sites, refuse to engage any political chatter or education. And yet, they sometimes vote and hold strong beliefs. As Marc Applebaum recently stated, “Ideally, I would say, our beliefs should be based on critically evaluated knowledge and the knowledge we have gained should be rooted within a framework of passionately-affirmed beliefs.” (https://www.saybrook.edu/newexistentialists/posts/10-08-13). These beliefs exist independent of critical thinking that might confirm or disconfirm them as valid notions. In this state, you might as well throw darts in the dark as vote for a favorite candidate. Given all of these notions, it is no surprise that our education system is getting worse. Core knowledge sounds like a good idea: we decide what our children need to know and standardize education across the country, making it so even struggling schools turn out students who have a basic knowledge of how things work. The Texas board of education can no longer drive our system towards belief, away from knowledge, in a partisan fashion. But we still have the monumental question of who decides? Qui custodiet ipsos custodes, in the words of the playwright Juvenal. Will this program make us more or less critical consumers of government? Other nations value their education. This is why we are lower on the rankings than our national standing and wealth would suggest is reasonable. We are not helped by notions of egalitarianism that got started around the time of the Revolutionary War: seeking to define ourselves as separate from and different from our British originators, we defined masculinity as everything opposite 17th century British notions of masculinity. So poetry, wigs and lace were out; the artisan who works with his hands was in. Ignorance and unquestioning belief are as good as knowledge, and nobody is smarter than anybody else (we can even see this in the undue democratization of intelligence that is Gardner’s multiple intelligences: everyone is smart in their own way). If you ever went to an American school, you have seen kids abused by their peers for any deviation from average intelligence, low or high. At a recent political event, one candidate called another candidate a snob for thinking all Americans should aspire to go to college; he was speaking to this very set of low-information voters who operate on belief and are resistant to facts. In other words, the very people who could benefit from better education. This same person was concerned that colleges change our minds about our religious and political beliefs. Kids come home less fundamentalist and more liberal. As late as 1998, James Loewen noted that in fact the reverse was true: college graduates tended to be MORE conservative. However, at this time (and likely still) the best predictor of whether you would graduate college was whether your parents graduated college, the best predictor of your lifetime wealth was your parents’ lifetime wealth, and the best predictor of your political affiliations was your wealth. Even so, given these statements about education (that they change minds), doesn’t this tend to suggest that fundamentalist and uncritical conservative beliefs are not grounded in the sorts of knowledge that we need in order to think critically through the issues? That is, shouldn’t this knowledge cause one to question one’s beliefs rather than attack learning itself? Our university system is under attack. For-profit interests are among the least of our worries, driving up costs while lowering admissions standards, putting pressure on the traditional system to do the same. More worrisome still is the tendency right now to view education as a commodity to be bought and sold, mortgaged and advertised. This commodity is built on the facts around education and earnings: people with more education tend to earn more money. Schools highlight this fact and sell education as a means to a better job rather than for its own sake. This means increasingly more classes that focus on the practical, taught by people working in the fields in question, and less general education that makes us better critical thinkers. One of the schools where I teach has new teacher evaluations. Some of the criteria include not wandering off-topic, delivering the information from the approved material, and lecturing to the exclusion of all other methods. In short, read the book to the adult learners and bring to bear none of the experience for which I was prized when I was hired. For-profit schools have lobbyists working full-time to keep up these sorts of pressures. They profit from students not being educated enough to make other choices (either because they do not qualify for other programs or do not know their alternatives) and manipulate legislation to make this both legal and profitable, forcing other kinds of educational institution to keep pace. All of this results in people who are trained to do jobs but not educated to be good citizens. Moreover, we lack the education right now to see how these factors are working together to create the tyranny Jefferson feared so many years ago: a corporate, for-profit tyranny he could never have forseen. Education is good for its own sake and everyone should get as much as they can. Ignorance is not as good as knowledge. Going to school makes us better consumers of data, able to tell oratory tricks from legitimate arguments, aware of the history implicit in our circumstances, knowledgeable about justice and how and why it is missing, able to ask questions like “why?” and “who profits”? Education, as one for-profit schools claims, makes the world better. It makes US better, whoever we are—more powerful, considerate, and yes, profitable. Pick your education carefully. Always study the data, and first learn how to understand data. Give to organizations that sponsor education for people who otherwise could not afford it. Never let ignorance pass for knowledge. Always point out when oratory is used to confuse issues, such as through ad hominem attacks. Watch more satire and less cable news.